Tweet Each Wednesday during Mitochondrial Disease Awareness Week is set aside to remember the lives that have been lost to mitochondrial disease. Mitochondrial disease runs the gamut from fairly manageable disorders that have little effect on overall life expectancy to disorders that still carry an overall fatal prognosis. For Klaw, his first year of life was the most tenuous but management of his VLCADD has been successful. He is expected to lead a fairly typical life with continued health management and regular observation of his liver and heart functions, barring any surprises or major illnesses which could throw him into a metabolic crisis. For others, there is a steady decline in the function on major health systems. Many children with mitochondrial disease do not survive to reach adulthood. For some adults, a typical, productive life can suddenly take a downturn to debilitating symptoms with little to no hope for improvement. 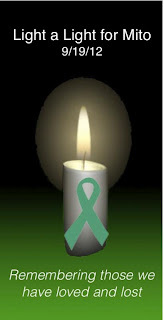 If you or someone you know has lost the battle to mitochondrial disease, please take moment to light a candle in their memory. Tweet People regularly ask me how we manage Klaw's diet in relation to his VLCADD. He is currently limited to 6g fat per day. Most toddlers should get 40-50g fat per day. As you can imagine, this can make it difficult for us to just pick up something at the grocery store or at a restaurant for him to eat. In order for Klaw to eat "fun" meals that incorporate a variety of flavors and foods, we pretty much have to cook at home. It's the only way we can guarantee the amount of fat in each serving. However, sometimes I just don't feel like measuring out each ingredient and using MyFitnessPal or another online recipe app to do the math and determine the fat/carbs/protein in each serving. Sometimes, I just want to grab something, read the label, & hand it to my kid. Chris & I have found a few favorite "convenience" foods that we keep around the house that are low to no fat and that Klaw loves. Every (non allergic) kid loves a good PB&J, right? Well, not when one serving of peanut butter has more fat than you can eat in a day. Thankfully, Trader Joe's carries Better 'n Peanut Butter. It has 1g fat per tablespoon. We use that with sprouted whole grain bread, which is high in dietary fiber, high in protein, & low in fat. Our favorite sprouted grain bread is from, again Trader Joe's. Sprouted Flourless Whole Wheat Berry Bread has no fat at all. So, Klaw gets a full PB&J for a whopping 1g/fat. Most stores, including Walmart, are carrying the GoGo Squeez apple sauce packets. Apple sauce is, you guessed it, fat free. Yes, it's full of sugar but Klaw burns energy from sugar pretty efficiently. He's a VERY active toddler and he can't burn fat for energy. As long as he's going, going, going, the sugar in applesauce is not a big issue. A few other brands of squeezable sauces are also fat-free, but the GoGo Squeez brand seems to be pretty ubiquitous while we have to make special trips to Babies R Us or Target for the others. Pasta & marinara sauce is a quick & easy VLCADD friendly meal we frequently cook. However, I don't always want pasta. Gerber Graduates Pasta Pickups make two flavors, chicken & carrot and turkey & vegetable, which are low fat, easy to heat up, and Klaw loves both flavors. We do limit how often he can have these but it makes for a quick, convenient lunch or dinner option. Especially if Chris & I want to have something high fat like pizza or, well, just cheese for dinner. 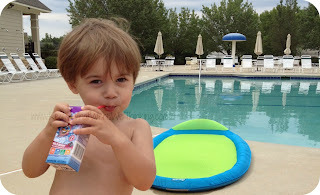 Pediasure Sidekicks Clear is a "juice" drink box for toddlers. It's completely loaded with the full spectrum of vitamins & protein. It doesn't contain dyes. Granted, it doesn't contain juice, either. However, Klaw pulls the toddler pickiness every once in a while and this drink provides a quick, convenient way to make sure he ingests calories and protein when he refuses to eat a meal. I don't know of any other fat & dye free drinks that also offer protein, so this is the best I could find. Granted, I have no issues giving him Gatorade Prime on occasion, if the situation and energy expenditure warrants it. We plan for the unexpected each trip each trip, whether it be traffic delays or just an overexertion by Klaw at play. We always have some of these convenience foods tucked away in Klaw's bookbag (our diaper bag) in case he needs a snack or if we just decide we want to go to a restaurant to eat. We can't take it for granted that we'll be able to find something for him to eat on the fly. Do you have an "convenience" foods you keep on hand for your kids? What are they? I finally got around to deleting my MySpace account the other day. Look, if you think that's bad, I didn't delete my Friendster account until I started writing this post. Oh, you don't remember Friendster? Shut up. Back to my MySpace post. Before I deleted the account, I went through my old "blog" posts and found three that were worth saving. Possibly worth sharing, too, but that's up to y'all, I suppose. Indulge me for a moment. I promise, it's super short. Okay, so I'm walking Boomer on this long walk by on the ocean trail to get him some extra exercise. It's been a half hour, so we cross Oceanview to walk back home on the sidewalk. I'm working on his training, making him stop at every crosswalk, etc. Well, he is not really wanting to sit at this one corner, so I am patiently waiting for him sit. This construction worker, complete with long silver curly hair is talking as he's walking past me. It actually took me a minute to register that he was actually talking to me. "Nature don't make no mistake. Your mama did you right, girl." I guess I need to call Joye and thank her for doing me right. I'll do it right after I bathe the dirty creeped out feeling off of me. There you have it, folks. The beginning of my blogging career. Epic, huh? Seriously, though, have you gone back to other social media sites or old blogs you started long ago and read some of your old posts? Do you get a kick out of it? Have you ever reposted an old (perhaps completely pointless) blog post? Please share some of your favorite oldies in your comments!